DRV Bhawan, C-1146, Indira Nagar, Lucknow-226016, UP (India). Tyagarchana Shanti Mission (TSM) in an interreligious mission for peace and communal harmony in India through a spiritual regeneration of our motherland based on a spiritual regeneration programme termed ‘Tyagarchana’ and a peace-culture programme termed ‘Pancha Sutra’. It presents and promotes a vision of a great new India of peace, prosperity and power; a great new India that will be a mother of love and princess of peace in the world family of nations. Tyagarchana Shanti Yatra (TSY) is a pilgrimage of peace to promote interreligious cooperation and communal harmony in UP based on the time-tested programmes of Tyagarchana & Pancha Sutra developed and authored by Swami Sachidananda Bharathi (Air Force Baba). It is an interreligious mission based on the Fundamental Duties of Indian citizens as enshrined in the Indian Constitution under Article: 51-A (e) that calls us to promote harmony and the spirit of common brotherhood amongst all people of India transcending religious, linguistic and regional or sectional diversities. TSY is a mission of love and peace for spiritual regeneration of India. The message of love, peace, harmony, unity in diversity, forgiveness and reconciliation will be disseminated to the common folk of Uttar Pradesh. The TSY will travel through the entire length and breadth of Uttar Pradesh under the spiritual guidance and leadership of Swami Sachidananda Bharathi, the initator of Tyagarchana Shanti Mission. It will be a 100 days 'pilgrimage' and will cover around 125 towns and cities in U.P. Through rallies, seminars, cultural programmes, messages, posters, candle light services etc. the message of peace, harmony, love, peace, forgiveness and friendship will be conveyed in educational institutions and in the public places in villages and towns. Why Tyagchana Shanti Mission in U.P. ? "Tyagarchana Shanti Mission" (TSM) is a peace-building initiative born from the pain and agony of the Muzaffarnagar communal violence in 2013. Swami Sachidananda Bharathi was involved in a peace and reconciliation project in Muzaffarnagar and nearby districts. The aim of TSM is to promote interreligious cooperation and communal harmony in India. U.P. had witnessed more than 250 incidents of communal violence, small and big, during 2013! M P is number two with around 85 incidents. The recurring communal and caste violence and religious conflicts in India are destroying the fruits of decades of her hard-earned development. Incidents of such violence and conflicts are also making India slide backward in her growth ladder. Communal and caste violence and religious conflicts can be countered effectively only by developing a unitive divine consciousness through a spiritual regeneration of India, especially of religions in India. UP is the state with maximum incidents of communal violence in India according to a statistics released by MHA, Govt. of India. Hence, UP is chosen as a pilot project for TSM. 1. Shanti Yagna: Meditation for forgiveness, reconciliation and inner peace. This five-point programme will also bring about a moral regeneration of India and religions in India. TSY will be launched on 15 August 2015, the 68th Independence Day from Varanasi, the religio-culltural capital of India. It will conclude on 30th Jan 2016, the Martyrdom Day of Mahatma Gandhi, the father of nation, at Lucknow. Creating awareness among students, youth, and people of U P on the need of attitudinal change in their lives for peaceful and happy co-existence. Awakening the religious communities, educational institutions, NGOs and other agencies in U P to become effective agents of communal harmony and national integration. Helping people in U P who join the Tyagarchana Shanti Mission to become better human persons, and enjoy greater peace and happiness in their personal and family lives. With the money saved from acts of Tyagarchana by people and students of goodwill from different parts of U P joining the TSM, a 'Tyagarchana Education Fund'(TEF) will be created to help needy girl children who are victims of communal/caste violence in U P. Girl children are chosen as the beneficiaries of the TEF project because 'a girl educated is a family educated'. An educated woman will be a light unto herself and her family. Both Tyagarchana Shanti Mission and Tyagarchana Shanti Yatra will require a great amount of funds and resources. We also propose to set up a Tyagarchana Shanti Gram at a suitable location in or around Lucknow as a National Center to promote peace and communal harmony in India. Navasrushti International Trust (NIT) which coordinates TSM and TSY movement solicits your generous contributions to achieve these objectives. Contributions to NIT are eligible for IT Rebate under Sec 80/G. Copies of Audited Accounts of the Yatra will be given to all who contribute Rs. 5,000/- or more to NIT for this purpose. 'Tyagarchana' is an interreligious 'sadhana' (spiritual exercise) for reducing the negative forces of selfishness, greed, pride, lust, corruption and violence that are present in our human nature. These are the root causes for most of the problems in the world. Tyagarchana will help to reduce these negative and self-destructive tendencies and help to develop in their place love, compassion, goodness and other life-enhancing values. It will also help to bring down showers of divine blessings upon oneself and others. Conscious and willing sacrifice of something dear to one's heart, and using the saving from that sacrifice for rendering loving and selfless service to needy fellow human beings are the two basic requirements for making any service activity an act of Tyagarchana. Skipping a meal once a week and using the savings for feeding a poor and hungry person with love; giving up ice cream/sweets/coffee/tea/alcoholic drinks/cigarettes and such items now and then or totally and using the savings to educate poor and needy children with love; devoting some prime time for being with one's spouse and children with love; taking care of one's old parents with love; giving up some luxuries and celebrations and using the savings for rendering selfless service to poor and needy fellow Indians with love etc. are examples of acts of Tyagarchana. Tyagarchana is not to be confused with social service activities funded by Govt. sources or by CSR funds or by donations/contributions from the well to do people. It is also not to be confused with such programmes like poor feeding, distribution of free items to poor, and dolling out charities to the needy that are undertaken normally by people whose motivations are often their own name, fame, happiness or salvation. Willing sacrifice and loving selfless service with the savings from such sacrifice alone will make any act an act of Tyagarchana. Practicing at least one act of Tyagarchana every day will help to make us better human beings. When an optimum number of people in our country take up such acts of Tyagarchana every day, Mother India will be blessed abundantly. She will be transformed into land and light of peace and righteousness on earth. It will also bring down showers of divine blessings upon all Indians and whole India. Tyagarchana & Pancha Sutra are time-tested programmes developed and authored by Swami Sachidananda Bharathi for spiritual regeneration of India and global peace. Swami Sachidananda Bharathi is a former Indian Air Force Squadron Leader turned promoter of peace and spirituality. He is also popularly known as 'Air Force Baba'. An encounter with death in an air accident in 1982 and the subsequent spiritual experiences transformed radically the life of the 35-year old atheist Squadron Leader. Four gurus came into his life through dreams at four different stages in his pilgrimage of faith and quest for peace and provided him with the necessary spiritual guidance. In his spiritual quest he has also experienced the truth, goodness and beauty of four world religions - Christianity, Hinduism, Islam and Sikhism. He received 'Acharya diksha' in 1990. He renounced private property and family life in 1996 with the permission of his IRS officer wife. 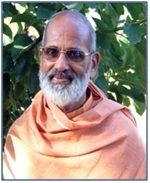 In 2003 he founded the 'Bharathi' Chaturashrama Sanyasa Parampara and took the name 'Swami Sachidananda Bharathi'. Swamiji has travelled widely and has authored a number of books. He was one of the delegates who represented India in the 'Millennium World Peace Summit of Religious & Spiritual Leaders' organized by the United Nations in August 2000. Swamiji undertook a year-long peace pilgrimage across India during the year 2007 and initiated the 'Second Freedom Struggle' for a 'Hunger-free, Caste-free & Corruption-free India' that is now being transformed into an 'Integral Revolution' based on his latest book 'INTEGRAL REVOLUTION'.